Adoption USA presents findings from the first nationally representative survey of adoptive parents in the United States. About two percent of U.S. children joined their families through adoption. 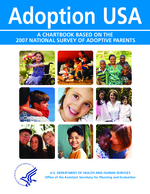 The chartbook describes the characteristics, adoption experiences, and well-being of these children and their families, making comparisons between adopted children and the general population of children in the U.S. and among children adopted through different adoption types.